This is a guest post from University of Virginia political scientist Eric Patashnik. The United States Preventative Services Task Force on Monday issued a report advising healthy women who do not have symptoms against receiving routine screening tests for ovarian cancer. According to the expert panel, the screenings are not effective in lowering the death rate from the disease, but generate a high percentage of false-positive results that “can lead to important harms, including major surgical interventions in women who do not have cancer.” This is not the first time that a common diagnostic test for cancer has been questioned. This task force had earlier advised against prostate specific antigen (PSA) tests for healthy men and against annual mammograms for healthy women under the age of 50. Many medical experts argue that American patients are overdiagnosed and overtreated, and that evidence-based guidelines can improve the quality of health care. It remains to be seen whether the recommendation on ovarian cancer screenings will be embraced by physicians, patients, and policymakers. The mammogram guideline was of course very controversial. Many patient groups expressed outrage about the perceived emphasis on reducing health care costs, and some Republican officeholders said it illustrated the kind of rationing that will occur under the Affordable Care Act. A Pew survey found that 68 percent of people who followed the news about the change in the mammogram guideline disagreed with the task force’s recommendation. The Obama Administration, already fighting allegations that it favored “death panels,” responded to the outcry by promising that government insurance programs would continue to cover mammograms for women starting at age 40. As the U.S. struggles to control health care costs, it is important to understand how the American public thinks about these issues. What arguments about evidence-based treatment guidelines does the public find most and least convincing? In 2009, Alan Gerber (Yale University), David Doherty (Loyola University Chicago) and Conor Dowling (University of Mississippi) and I performed a national survey of 1,026 respondents to investigate this question. Our survey found some public support for the main arguments that experts give for using research-based guidelines. Nearly two-thirds of survey respondents were somewhat or very convinced that economic incentives might cause doctors to give patients unnecessary care or the wrong care. In addition, a little more than half were somewhat or very convinced that doctors can lose touch with the latest research and that they follow local standards of care and therefore may be unaware of better treatments being used elsewhere. However, no more than 20 percent of respondents found these arguments to be very convincing. 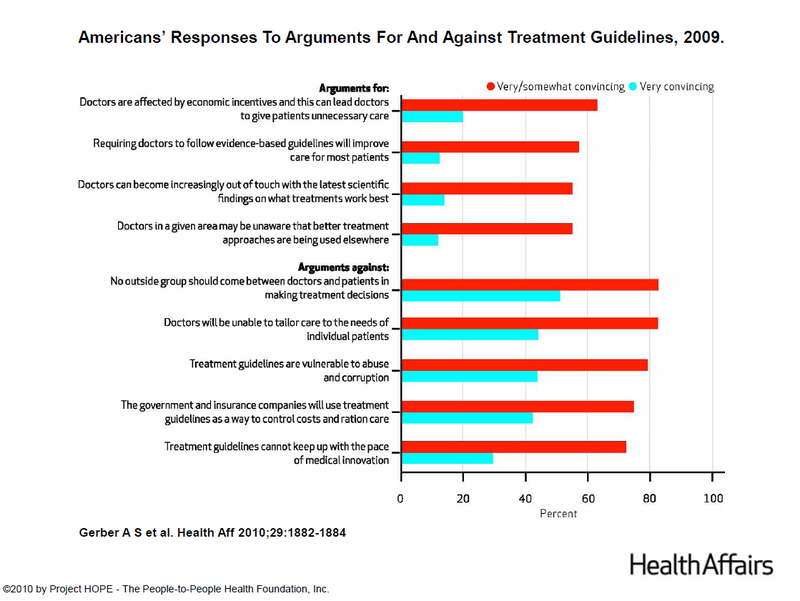 In general, respondents found the arguments against guidelines more convincing. More than eight in ten were convinced that guidelines would prevent doctors from tailoring care to the needs of individual patients and that no outside group should come between doctors and patients in making treatment decisions. More than seven in ten believed that guidelines would be used to ration care, are vulnerable to abuse, and would not keep pace with medical innovation. The proportion of respondents finding each of these arguments to be very convincing ranged from 29 percent to 51 percent. Among subgroups, Republicans and seniors were most wary about guidelines. Proponents of evidence-based medicine will need to address these concerns before treatment guidelines can win broad acceptance among ordinary Americans.